Nice tutorial. I want to save this for when I make my table. I really love this, but I'd still like to access the storage at the front of my machine, and I realize I won't be able to open it when it's in a table like this. Any ideas? Thanks for your thoughts - this tutorial is really awesome. I think the easiest way would be to make a second cutout on the tabletop just in front of the machine after you make the hole for the machine. Keep that cutout intact and save it. 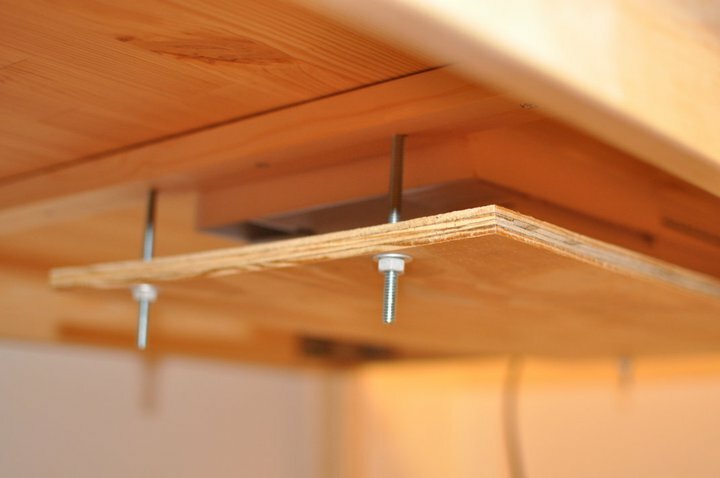 Then build up a small ledge on three of the sides underneath the table with a 1.5"x 1/2" (or so) strip. Then you can lay the cutout you saved there. 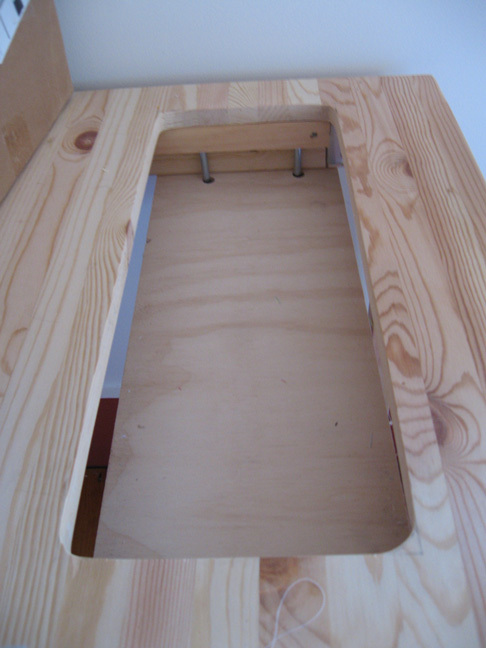 Then drill a finger hole or cutout a small opening on one side to make it easy to get in and out. This method may not work if you need to have direct front access to the machine (not just access to the front from above), or if your machine has to be close to the front cross member (either because you already made it, or if setting that far back feels uncomfortable). This is great and works nicely with a flat bed machine. 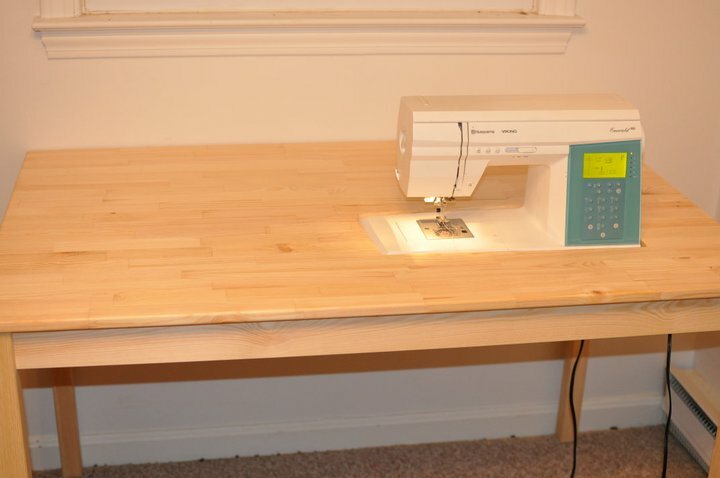 But if you have a free arm look at the Sewperfect tables. They use a plexiglass surround which you can buy from Dream World to fit your machine and your needs. It is larger so if you need to use the free arm you can remove the large plexiglass surround and have a big well so you can hem pants and make an armhole ect.... And you can also make it big enough for an emboidery unit. to operate. 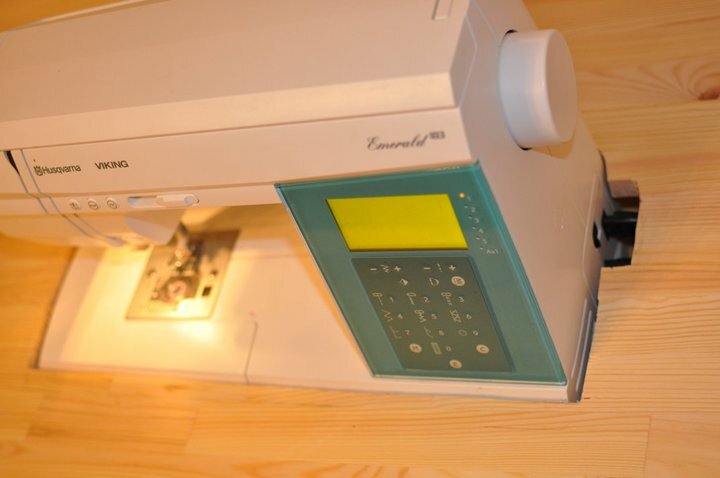 If you have a machine that is buttom loaded like a Bernina or Juki, then instead of using a table like this you sort of make an open front sandwich and access the bobbin that was or if needed remove the plexi insert and have space around. 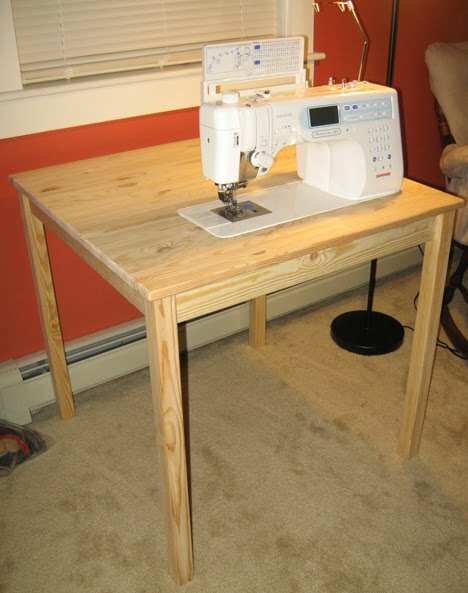 See Unique Sewing Furniture. 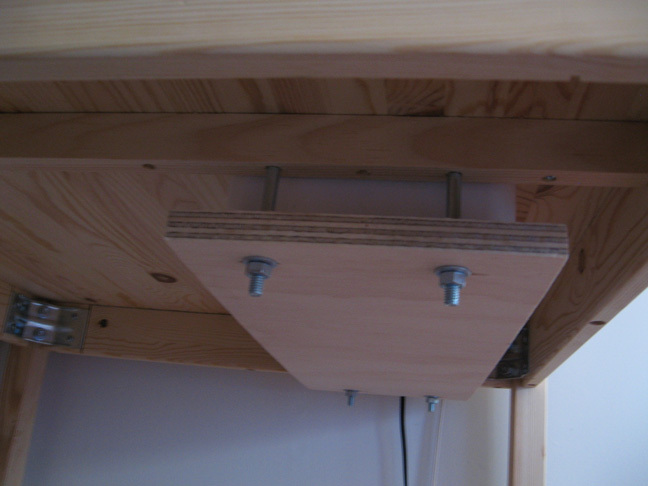 You can use either industrial K legs, that have an adjustabel height or the Galant legs from Ikea. two layers of wood Like a furniture grade Birch 3/4 in plywood. 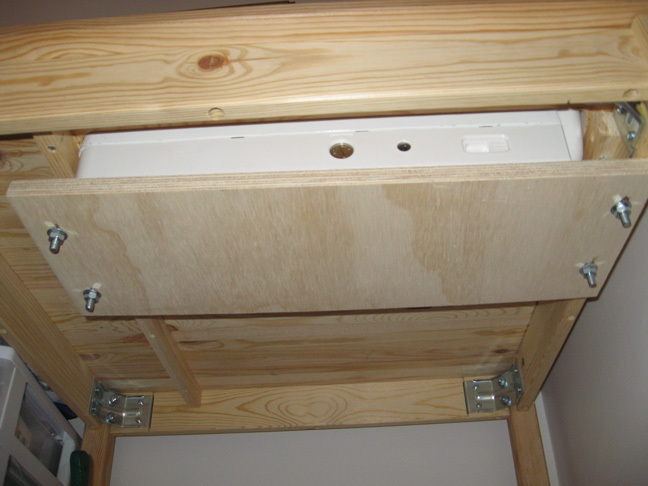 If you want it to be heavy duty then you can glue to layers together. and proceed as you have explained. Jig saw it out and make a plateform for the machine and the plexi table surround. Just another way of doing it. Now that I see yours I am very encouraged to do a similar set up. I really love this! I will save this for when I make a table. Ikea still lists your table if it is 29"x29". It is called Norden and is $79.00. The best part is the Mr. was at work. So many women seem to take pride in their husbands doing all the heavy lifting, I always wonder why. YOU GO GIRL! Genius! I've just opened up a business on Etsy....sheislivinoutloud.etsy.com. Yeah! Most of my products will have sewing involved. The sewing tables I've seen for sale are particle board and/or stupid expensive. This is a great idea....solid wood and strong. I'll be making my table longer to accommodate two machines. Thanks for the idea! Thanks so much for this tutorial - I followed it and made my own, though I used a piece of MDF rather than a table, as I needed something longer to hold two machines! You can kind of see it in my blog here, http://workshopinthewoods.blogspot.co.uk/2016/02/workshop-reveal.html But I plan to do a proper blog about it t soon! 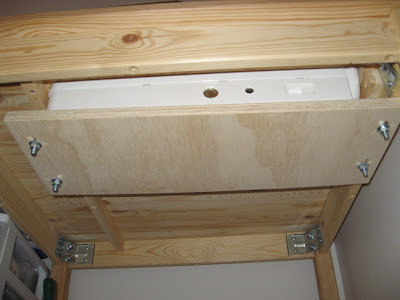 My husband made one out of an old 6 ft. bedroom dresser, so I have the drawers for storage, and the other side where the machine sets, is an open shelf for small storage under the machine. Been using it for years, and love it. I know its been awhile since you posted this,I hope you see my comment. I wanted to give you a huge thank for your detailed directions. Husband has a new project. I have health issues. Live in chronic pain. By having a larger table for support and installing the machine lower, I possibly will be able to enjoy a little sewing from time to time. Hi there. Thanks for the post. Unfortunately, the link you shared for your updated plans is not working.